Simple UI tool that allows to select controller and see events when buttons pressed/released or axis used. 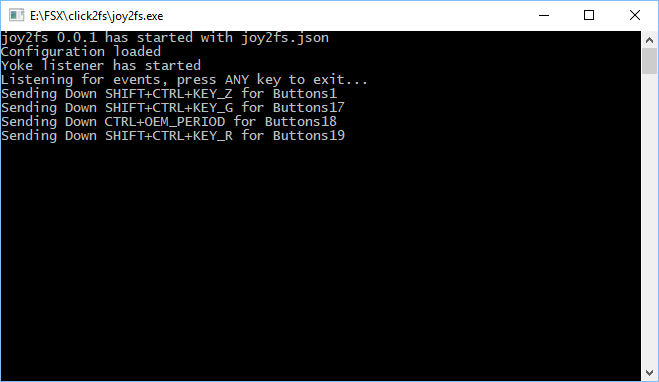 It&apos;s helpful to find out names of controllers and buttons that can be subsequently used in configuration file for joy2fs tool. Those names are not matching what FSX shows. Please make sure buttons of controller used in this tool are not assigned to any actions in FSX. 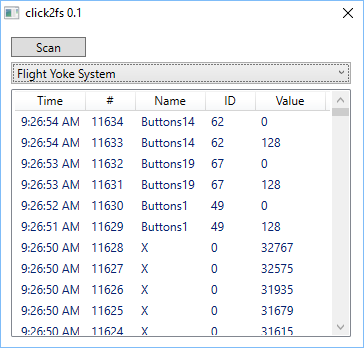 In case joy2fs tool can&apos;t find FSX window key combinations will be sent to any foreground window. As a side effect it opens up some new use cases. For example you could use buttons on joystick to change audio volume up and down. I am planning to add support for P3D in near future. NOTE1: It&apos;s important to run this tool as Administrator. Otherwise key combinations won&apos;t be received by FSX. NOTE2: When tool started external controllers should be already connected to your PC and recognized by Windows. Best way to check it is open Device Manager and find controllers in tree of devices.